Aboriginal art tableware sets, including place mats and drink coasters, provide for an interesting setting in which to appreciate the unique Indigenous art of Australia. Dinner guests’ eyes can feast on aesthetic wonders and sacred geometry while dinner guests themselves feast on food and drink. The dinner party atmosphere becomes conducive to inspired conversation as the topics flitter in the night light. Sense the glow of a dancing corroboree fire, lit by the falling stars of the Southern Cross. A jabiru struts in the moonlight as a frilly necked lizard scuttles in the dust. A kangaroo hops past the gum trees, watched by pairs of eyes between the leaves. Indigenous eyes, dreamy and keen and curious, reflect the shining constellation to produce the effect of a Van Gogh matured by a walkabout for seventy thousand years. The koala and the Australian Aborigine gathering bush tucker let the kangaroo continue on a journey to the billabong watering hole. Australia is the land under the Southern Cross, manifested by ancestors who have become the land and the sky. 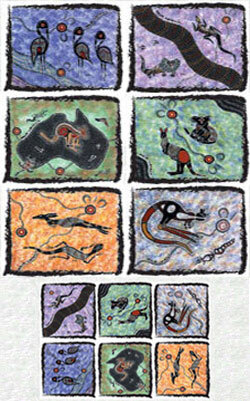 These spirits transformed into country during the Dreamtime, the time of creation. We can feel our own prosaic descendancy within an all-encompassing sanctity. As we pass the wine and butter the damper, it’s possible to catch a fleeting glimpse of the desert. Out of the corner of your eye you perceive a goanna in a brief desert meeting with a passing kangaroo. How can Aboriginal art tableware, placemat and coaster sets and other homeware featuring Indigenous art designs be purchased from Australia Gift Shop? • Visit Australia Gift Shop online at www.australiagift.com.au .